Ah! It's _there_! Thank you, found it. Broken with the same "Assertion failed" though. It seems, some contacts are broken... Well, at least I can try to experiment with it. ...But there is other problem appeared: if I have the same contact in the several protocols, it exports everything into the same one file, with header of one, first protocol. I can circumvent it by renaming contacts manually - but I think it worth to fix it in future plugin releases. Actually the plugin is fairly sophisticated and indispensable. It already offers this functionality - you can specify it using the variables. My fault. I totally could find it myself. Just in case I missed something else: what "clear" in context menu means? And is there way to un-tick everything? (So far I use mouse selection - export, but with ticks it would be slightly more transparent... if I could select needed contacts between three hundreds). mdbx_dump.exe -n -a -f 1.tmp "path/to/corrupted.dat"
So today miranda randomly corrupted my DB like has been the case lately, so I had a chance to test these tools. I noticed my DB had been corrupted when I typed something in a discord chat and it did not appear in the chat window despite being sent. Not sure if it knows the db is corrupted or if it says this by default; I believe we are using mdbx sort of against its spec or something, so it'll always think it's corrupted. Maybe @Ghazan can comment. -> mdbx_load.exe: took incredibly long to run. I guess about 20 minutes on a 473MB DB (well it was ~680MB when "dumped") with somewhat high disk activity. Get your tea and sit back for this one. Recovered DB -> on startup, appears as completely empty, some settings lost. No accounts or protocols or users. History++ shows "ACCOUNT UNLOADED" for every contact, but contacts are present there. Still.. Trying to import this DB instead of using the recovery tool, it shows "Skipping contacts with no protocol" and imports nothing. Instead, trying to import the corrupted db with miranda by creating clean db and importing it via import.dll produced better results, actually preserving all of the data up till when the failure occurred apparently. Well, not all. It deleted "duplicates" which were not duplicates but events with identical second timestamps. So data is lost in this case. @ghazan can you please disable this checking on db import? And well for the mdbx tool introduced, what is the use case of the recovery tool? Also @unsane, how is the sqlite db coming along? :p I'll host it on raid0'd SSD if it's stable and simply slow. Oh also the best thing ever. 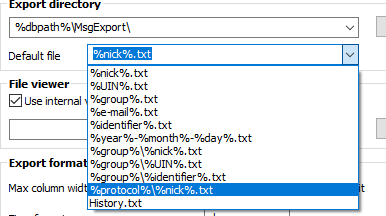 The repaired profile actually loaded some default settings I guess, and what that did is it deleted all of the old backups in the autobackup folder so now I have no backups other than exported jsons + from past week when I do my actual offline backups. I can recover everything but damn. This fell through even my expectations. should have been fixed in the development version. would you please check it? Sorry, I am slightly distracted by other activities, but I'll try to check it somewhere at weekend. And sorry again, there was too many different events that delayed everything. 1. Import now works! Too bad that it excluded mostly all my newer database history. Seems, broken history is lost forever. But old one, that was broken before, loaded just right. Thank you! 2. After I made sequential import from march to december, I got mostly everything back. Except gaps here and there where base went crazy and lost history. :| Well, will do. 3. New fix and export tools doesn't work, and I have no idea why. It gives me errors, but it looks like Russian in bad codepage. See attachments. Otherwise, it works at last. Thank you!